German soldiers from the Einsatzgruppen are looking for valuables in personal things at the place of mass executions in Babi Yar, Kiev. The photo was taken 10 days after the fall of Kiev by German military photographer Johannes Hale, who was in the service of the 637th company of propaganda, which was part of the 6th German army that seized the capital of the Ukrainian SSR. Babiy Yar is a tract in Kiev, which received a notorious reputation as a place of mass shootings of civilians and prisoners of war carried out by German occupation forces. Here were shot 752 patients of the psychiatric hospital. Ivan Pavlov, at least 40,000 Jews, about 100 sailors of the Dnieper detachment of the Pinsk military flotilla, arrested partisans, political workers, underground workers, NKVD workers, 621 members of the OUN (A. Melnik’s faction), at least five Roma gangs. 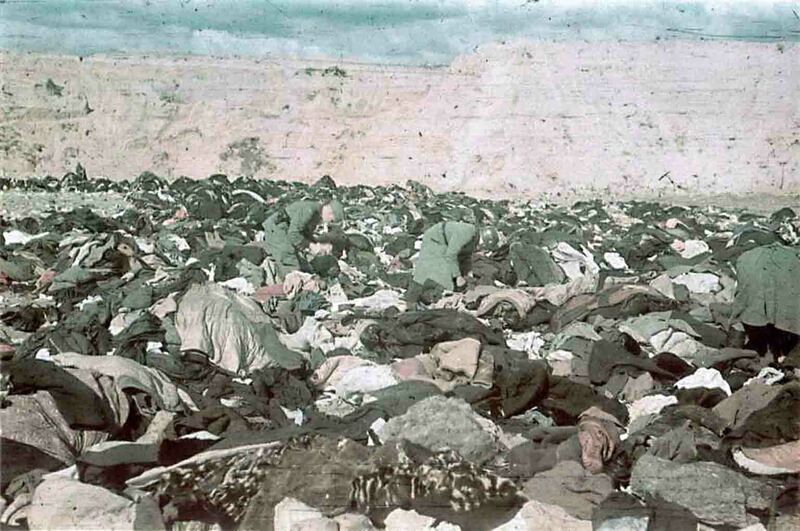 According to various estimates, between 70,000 and 200,000 people were shot in Babi Yar in 1941-1943. From September to the end of October 1941, executions were mainly carried out by mobile SS units (Einsatzgruppen and police units) with the assistance of the field gendarmerie and parts of the Wehrmacht (454th Security Division, 75th and 299th Infantry Divisions). From October 1941 until the end of September 1943, Babi Yar was the site of regular executions carried out by the security police and SD in close cooperation with the military and civil authorities of Kiev.